Carlos Slim, the world's second richest person, believes countries need more middle classes. 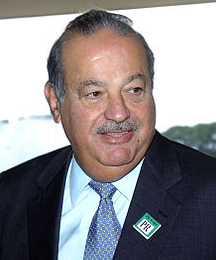 HOUSTON— Increasing workers’ earning power and offering Hispanic-owned companies easier access to funding that can be used for growth can help improve the social and economic status of Latinos in the United States and across Latin America, Mexican billionaire Carlos Slim says. In a speech at the annual conference of the Catholic Association of Latino Leaders, Slim spoke on how to better the plight of Hispanic workers and Latino-owned businesses. Slim, ranked by Forbes magazine as the world’s second-richest person, with an estimated net worth of $72 billion, suggested establishing investment firms dedicated to working with small- and medium-size Latino businesses. He also said that following recent economic crises, countries need to focus on strengthening the middle class as well as health care and education. ‘‘What is important is that people earn more and that more middle classes are formed,’’ said Slim, who owns America Movil, a cellphone service provider in Latin America. Slim also reiterated his recent proposal for a three-day workweek. He said the idea would mean longer work hours and delaying retirement until 70 to 75 years old. But he said it would mean people having more free time with their families or for personal enrichment. Last week, Slim’s foundation unveiled Acceso Latino, a free website to provide Hispanics access to information about education, health care, job training, culture, and other areas. There are more than 53 million Hispanics in the United States, or 17 percent of the population, according to census figures. Slim said this makes the US Hispanic population larger than the populations of many Latin American countries. Martin Cabrera, chief executive of a Chicago investment firm, said there are already multibillion-dollar pension funds that have investment arms that provide financing to startups and other companies. But ‘‘the amount of business they are doing with Latino [companies] is close to zero,’’ he said. Cabrera said Slim could use his influence to start a dialogue with pension funds and their investment arms to get them to see the potential of investing in Hispanic-owned businesses.